This effective forex technical indicator, Ehlers Fisher Transform, is introduced by John Ehlers. This indicator is first published in the article entitled "Using The Fisher Transform" in the November 2002 issue of Stocks and Commodities Magazine.The indicator has two lines fishers line and signal line, and a zero line. The entry and exit signals using this technical indicator can be found in multiple ways. Firstly, a buy order can be placed when the indicator gives a reading at oversold level, and then the signal line crosses the Fishers line from down. In other side, a sell order can be placed when the indicator reaches to the overbought level, and then the signal line crosses the fishers line from up. Secondly, a zero line crossover from down can be considered as a buy signal, and a zero line crossover from up can be considered as a sell signal. Thirdly, the bullish divergence and bearish convergence technical analysis technique can be applied with this technical indicator. Read the post on 'bullish divergence and bearish convergence' to explore more. 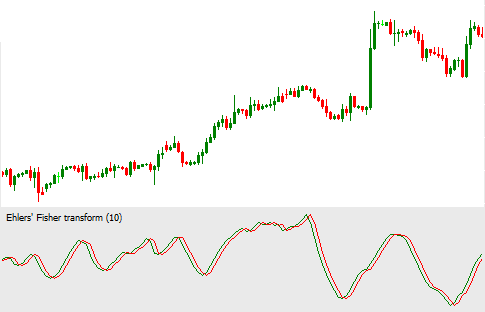 Dear Traders, Ehlers Fisher Transform technical indicator is one of the best forex technical indicators. The default period of this indicator is 10, but other period can be applied as required. A longer period Ehlers Fisher Transform indicator will give more reliable but infrequent signals, whereas, a shorter period Ehlers Fisher Transform indicator will give frequent but less reliable signals. This versatile indicator can be used by all type of traders, and it can be applied on the chart of any time frames.